Working with siblings to care for aging parents can be stressful and frustrating. There’s a lot to deal with – old conflicts, living in different places, tough decisions, and unequal contributions. Kathy Macaraeg from Caregiving Made Easy shares useful advice on how to handle these challenging situations. Her tips help everyone put aside differences and focus on what’s best for the parents. How to handle past rivalries so your parents’ care doesn’t suffer. The best thing about having a sibling is that you have someone who knows every part of your history and childhood. They’ve literally known you since day one. Unfortunately, they also know which buttons to push and are either so much like you or so dramatically different that trying to work together as an adult, even for the common cause of caring for an elderly parent, can be challenging. Old grievances can resurface and make it difficult to focus on the task at hand – your elderly parent’s care. So, how can you work together to ensure your parent is receiving the proper care and this doesn’t cause undue stress on you and your parent? One challenge siblings have, particularly if one sibling doesn’t live nearby, is they view their parent’s care needs differently. The sibling who sees the parent regularly doesn’t notice decline since it is gradual. When an out-of-town sibling comes to visit, they are shocked by how much mom or dad has aged. They see the small things because it is different from the last time they saw mom or dad. They immediately want to jump in and make sweeping changes and the local sibling gets frustrated because they know their parent is still capable of handling many tasks. Ideally, your parent is still able to make his or her own decisions so you can all sit together and plan how to manage their care. Don’t put them in the middle of your sibling rivalry. You are adults now, you can work together without putting your parent in an awkward position. Before going into the discussion, agree that you are all working together for a common cause – the best care you can provide for your parent. Of course, this is easier said than done. In business, we can work with people we don’t like because it’s business and there are not emotions tied to it. Unfortunately, when it comes to family dynamics, it is all about emotions so it can be difficult to set aside personal feelings. Agree to go into it with an open mind and consider each making a list of your non-negotiables so you know what the hot buttons are. Provide pros and cons for your recommendations to remove the emotions. Does your sibling want to put you parent in an assisted living facility and you want your parent to age in place? Once you’ve reviewed each other’s rationale, it may help you make a more educated decision of what is best for your parent, not what is best for you or your sibling. If your parent is experiencing cognitive decline or dementia, it becomes more challenging to get their input as they may not be able to make decisions for themselves. If you and your siblings are not on the same page, you may need to bring in an impartial third party to facility the conversation. A facilitator can be anyone from a clergy person to a trained therapist. Once you’ve decided on a course of action, the next step is to figure out how to get it all done. 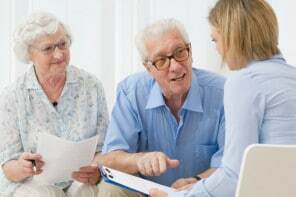 If you still have a problem agreeing on how to proceed, you may want to consider outsourcing care to a geriatric care manager, who can provide recommendations for care and keep everyone updated. One of the biggest complaints from siblings is that they didn’t know a decision was being made or they weren’t aware of a medical condition. It becomes less stressful when everyone knows their responsibility and the parameters for decision-making ahead of time. How you choose to communicate is up to you, but my preference is to maintain a document that holds all of the updates. You can download my family medical file or create a caregiving binder, family website or just maintain a regular email update. You may not get along, but you will have to work together. The easiest way to work together and not have tension and conflict is to divide the necessary tasks and decide who will do what. You can all sit together and make a list of everything that needs to be done and decide what you can each manage. Don’t leave the small things off the list, assuming they will get handled. Include everything from making medical appointments, scheduling or providing transportation to appointments, paying bills and housekeeping, grocery shopping and providing personal care for your parent. Once you have a clear picture, you can either divide it by like tasks or by the amount of time a task takes. For example, a family member who doesn’t live nearby or doesn’t have flexibility to take time off work can handle administrative tasks such as phone scheduling, bill paying, tracking medical care and service research, while someone who has more flexibility or works irregular hours can handle transportation to appointments, grocery shopping and personal-care tasks. I worked with a family that managed their mother’s care like a business operation. It was possibly the most effective strategy I’ve seen as they each knew their role and there was relatively little conflict on the day-to-day care. The oldest daughter lived out of state, so she handled her mother’s finances and researching service providers for local care. She scheduled interviews and appointments for when she was in town visiting. The middle child lived closest, but worked relatively long hours. He went with his mother on all of her medical appointments as she was in a wheelchair, making it difficult for her daughter to transport her. The youngest daughter lived somewhat nearby and had a more flexible schedule so she did her mother’s grocery shopping and checked in on her regularly to be sure caregivers were providing proper care. She was also the point of contact for all of their providers. Of course, their well-oiled machine worked extremely well for day-to-day care, but they had conflict like any family. It took them a long time to make decisions because they didn’t always agree on the next step for their mother’s care. They also disagreed on the type of care their mother should have and on modifications to her home. Luckily, since there were three of them, if they put something to vote, they would go with the winning vote. It doesn’t always work out so well for even-numbered siblings. Sometimes, the family members just have to decide what issue is their “hill to die on.” If one member has strong feelings about an issue and the other is not entirely sure their way is the best way, sometimes, for their mother or father’s best interest, they need to stand down. So what happens when, even after meeting with a facilitator and dividing all of the tasks, you find that you can’t get along and your parent’s care is suffering? It may be time to consider outsourcing. Ideally, your parents have the financial means to cover the costs, but if not, you may need to decide as a family, how much everyone will contribute, or if some members aren’t able to contribute financially, how they can contribute their time. I have seen some families divide caring for their parent with either financial help or performing the care. For example, I knew a family where one daughter was extremely well-off and lived eight hours away from her mother and sister. She paid for her mother’s living and care expenses and her sister, who was not financially stable moved in with her mother and provided in-home care. This worked for them as neither resented their role in their mother’s care. If your parent isn’t able to cover care costs and you and your siblings are unable to bear the financial burden, there are resources available to your parent. I explore them in the article on Caring for a Toxic Parent. You don’t need to have a tenuous relationship with your parent to utilize government resources available to them. Guest contributor: Being a caregiver is both physically and emotionally challenging. Kathy Macaraeg spent nine years working with both caregivers and their aging parents, giving her a unique perspective on their needs and challenges. After working one-on-one with families for nine years, Kathy decided to share her unique perspective with a larger audience through www.caregivingmadeeasy.com.